The Post Adoption Resource Center is a program of Orchards Children's Services and is funded by the Michigan Department of Health and Human Services. We invite you to Join a Support Group! We are dedicated to serving the needs of adoptive parents in Macomb, Oakland and Wayne Counties in Michigan. 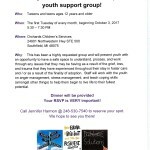 We now offer a teen support group for foster and adoptive youth! Check out resources in your community! We have compiled great resources specifically designed for your community, including parent support groups, on-line training videos, a digital lending library and more. Our PARC staff has selected some great reading for you. Take a look at our lending library! Navigating the journey to adoption can be complex and bring forth many questions about all stages of the process. This site was developed for professionals, prospective adoptive families, and older youth, to help answer some common questions, and make the process of finding information a little easier. Orchards PARC offers a 6-session on-line training that discusses all aspects of educational and financial aid resources for older youth and young adults from Foster Care. The classes provide detailed information about the application process and resources that are available. Check Out Events in Your County! Here’s what Michigan is doing to reduce the rate of broken adoptions for foster care youth. Orchards Program Manager Jane Cullen is interviewed on Michigan Public Radio.